From 2009-2015, Lindsay represented the ACT State Team in the Australian National Championships and was co-captain of the Under 14 and Under 16 teams as an able-body. She played for the Canberra Capitals Academy team in SEABL, winning the team's Rising Star award for 2014 and in 2016, she was awarded a basketball scholarship to play and study at Minot State University in North Dakota. Her plans unraveled in April 2016 though when she suffered a dislocated right knee, and underwent arthroscopy surgery. Attempting a comeback, her injury only worsened but the option of wheelchair basketball became open to her and she joined the mixed-gender team, Canberra Chargers. 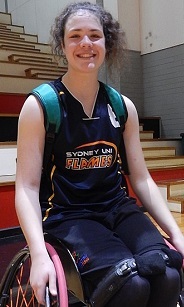 Playing for the Chargers brought an invitation to play for the Sydney University Flames in the WNWBL and her height and shooting touch made an immediate impact in the league. Becoming more accustomed to wheelchair basketball, Lindsay helped the team reach the Grand Final and in January 2017, she was named to the Gliders for the Osaka Cup in Japan. In May 2017, she was selected in the Gliders team to play in the World Super Cup as well as the Continental Clash against Germany, Japan and Great Britain. In October 2017, she played in the IWBF Asia-Oceania Championships, racking up 27 points and 10 rebounds in her first game, against Iran before helping them to a silver medal while also qualifying for the 2018 World Championships which she also competed at. Outside of Australia, Lindsay was awarded a four-year scholarship to play college wheelchair basketball for the Movin’ Mavs at the University of Texas at Arlington where she will become the first international wheelchair basketball player for the club.